The United States raises and slaughters almost 10 times more birds than any other type of animal. Approximately 8.5 billion chickens are killed for their meat every year, while another 300 million chickens are used in egg production. All birds—egg-laying hens, meat chickens, turkeys, ducks, geese and others—are excluded from all federal animal protection laws. By the numbers, these are the animals most urgently in need of protection. The ASPCA is focused on raising public awareness about the plight of chickens raised for meat and is working actively with companies that buy or raise chickens toward the adoption of better practices. Many people do not realize that the breed of chicken used for modern egg production is different than the breed used for meat production. If you put them next to each other, they look almost nothing alike! Each has been strategically bred for hyper-production: egg-laying hens for high egg volume, and “meat” chickens for maximum breast meat. Both types suffer from severe physical problems brought on by genetic manipulation. Read our report to learn more about the negative impacts of selective breeding in the chicken industry. Nearly all meat chickens are raised indoors in large sheds containing 20,000 chickens or more. The chickens live crammed together on the shed floor. Because they live in their own waste, high ammonia levels irritate and burn their eyes, throats and skin. Modern factory-farmed chickens look very little like their wild chicken ancestors. Thanks to selective breeding—combined with low-dose antibiotics, excessive feeding and inadequate exercise—factory-farmed meat chickens grow unnaturally quickly and disproportionately. While their breasts grow large to meet market demand, their skeletons and organs lag behind. Many suffer heart failure, trouble breathing, leg weakness and chronic pain. Some cannot support their own weight and become crippled, unable to reach food and water. To keep them eating and growing, factory farms restrict chickens’ sleep by keeping the lights on almost all the time. As they grow, meat chickens become crowded together, competing for space. This constant interaction makes sleep even harder. As chickens die, their bodies are sometimes left among the living, adding to the stress and unhygienic conditions. Learn much more about this issue in our paper, A Growing Problem. In 1925, it took 16 weeks to raise a chicken to 2.5 pounds. Today, chickens weigh double that in just six weeks! According to the University of Arkansas, if humans grew at a similar rate, a 6.6-pound newborn baby would weigh 660 pounds after two months. Chickens experience REM sleep, which is associated with dreaming. Unfortunately, on factory farms, lights are kept on almost all day and night to encourage more eating (and growth), which means chickens are chronically sleep-deprived. Some companies are developing policies and making commitments to address the effects of fast growth rate. Check out our video explaining the problem with broiler growth rates. Welfare-conscious companies and consumers are committing to certification programs that address the effects of fast growth and also require adequate space, more natural lighting cycles and enrichment for birds. Learn more in our Meat, Eggs and Dairy Label Guide. Because meat chickens represent the most numerous and some of the most abused animals in our food system, please demand change by pledging to Shop With Your Heart. Most egg-laying hens in the U.S. live on factory farms in long, windowless sheds containing rows of stacked “battery cages.” Up to 10 hens are packed together in one wire cage roughly the size of a file drawer. The frustration of living in such tight quarters sometimes leads to fighting. To lessen this problem, factory farms burn or slice off a portion of each hen’s beak (without painkillers). Hens who become sick often do not receive veterinary care or proper euthanasia, and are left to slowly die. This is not surprising given that a single shed may house tens of thousands of birds packed closely together, with many stacked in tiered cages that make them difficult to see and access. Where do egg-laying hens come from? A side-industry exists solely for the purpose of hatching them. Only female chicks will grow up to lay eggs, but half of the chicks born in these hatcheries are male. There is no market for the male chicks, as they are the wrong breed to raise for meat—so shortly after they hatch, they are killed by grinding, gassing, crushing or suffocation. When a hen’s egg production drops due to age, some farms will withhold proper nutrition for up to two weeks to shock the bird’s body into a final laying cycle. Once this “forced molting” phase is over, a hen is “worth” very little. Some are killed on-farm while others are sent to slaughter, their battered bodies used for food scraps. Battery cages provide less floor space per bird than a regular 8.5-by-11" sheet of paper. A mother hen in a natural environment begins to teach calls to her chicks before they hatch. The European Union banned battery cages in 1999 (allowing a 12-year phase out period, which is now completed). Some states are banning the use of battery cages. See where your state stands on confinement bans and learn about the historic effort in Massachusetts to help egg-laying hens and other animals. More than 100 retailers and companies have set policies going 100% cage-free. Welfare-conscious consumers and companies are committing to certifications that ban cages and also address de-beaking and require adequate space, nest boxes and other enrichments. Learn more in our Meat, Eggs and Dairy Label Guide. The U.S. raises some 100 million pigs for food each year, the vast majority of them on industrial-scale farms known for their crowded, inhumane conditions. At just two to three weeks old, piglets are removed from their mothers and placed in large, windowless sheds without fresh air, sunlight or outdoor access. Their pens are too small and crowded for adequate movement and exercise, and have hard slatted floors that prevent natural behaviors like rooting. Ammonia fumes rise to dangerous, uncomfortable levels due to the pigs’ waste. Pigs tend to be extremely curious and intelligent, so their barren surroundings cause them extreme frustration. The tail-biting that sometimes results leads farms to cut off the ends of pigs’ tails, and their teeth, without painkillers. Most female breeding pigs (called sows) in the U.S. spend their reproductive lives confined to a gestation crate. These crates are barely bigger than the sow’s body and prohibit her from turning around. Sows are artificially inseminated and kept in their gestation stalls until a few days before birth; at which time they are moved to equally restrictive farrowing crates to give birth. They remain there while nursing their young, and then are placed back in their gestation crates and re-inseminated. This cycle continues for several years, until the sows are no longer as productive and are sent to slaughter. In natural environments, about 24 hours before giving birth pregnant pigs will leave their social group to collect branches and soft materials to build a nest. The mother will stay isolated in her nest with her newborns for the first week, which allows her to develop a strong bond with her piglets. Both male and female pigs are raised for food. Pigs are as smart as or smarter than most dogs. They are one of only a few species Americans consider suitable for both keeping as pets and raising for food. Some states have banned the use of gestation crates. 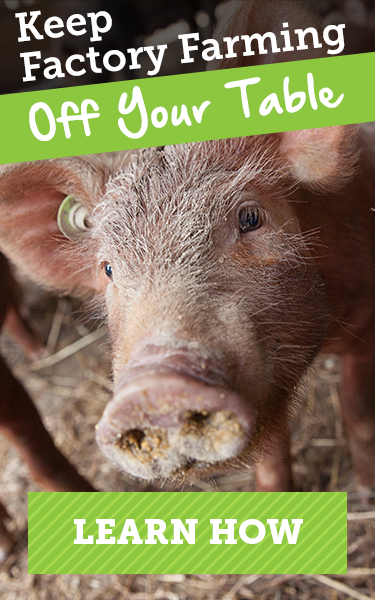 See where your state stands on confinement bans and learn about the historic effort in Massachusetts to help mother pigs and other animals. Dozens of companies have explicitly banned gestation crates from being used by their pork suppliers. ​Welfare-conscious consumers and companies are committing to animal welfare certification programs that ban cages and also address certain physical alterations, require more spacious and enriched group housing, and offer pigs adequate bedding and nesting materials. Learn more in our Meat, Eggs and Dairy Label Guide. Cattle are raised and processed across several distinct industries, all of which, in the U.S., rely heavily on inhumane factory farming. Cattle raised for meat are the only factory farmed animals still raised largely outdoors. However, this does not mean they have pain-free lives. They are branded, castrated and may have their horns removed without painkillers. Sometime between the ages of six months and one year, most beef cattle are sent to live their last few months in crowded feedlots with hundreds or thousands of others. Without pasture and often without shelter, the cattle must stand in mud, ice, and their own waste. Cattle form close friendships and choose to spend much of their time with 2-4 preferred individuals. They also hold grudges for years and may dislike particular individuals. To increase their weight, beef cattle in feedlots are fed an unnatural grain diet that is very hard on their bodies, causing illness, pain and sometimes death. Virtually all beef cattle are “grass-raised” because they begin their lives on grass. “Grass-finished” distinguishes the few that are never sent to a feedlot. Welfare-conscious consumers and companies are committing to certifications that ban feed lots and require adequate space and better diets. Learn more in our Meat, Eggs and Dairy Label Guide. Most cows used for dairy production are kept indoors, with some having access to outdoor concrete or dirt paddocks. Many are tethered by chains or other materials around their necks in what are called “tie stalls.” Unnaturally high milk production leads to mastitis, a painful bacterial infection causing a cow’s udder to swell. Dairy cows often have up to two-thirds of their tails removed without painkillers. Many producers believe the udder stays cleaner this way, even though this theory has been disproven. The cows are also dehorned and/or disbudded (have their horns, or developing horn material, cut or burned off), generally without painkillers. Just as with humans, cows only produce milk as a side effect of giving birth. To keep the milk flowing, dairy farms artificially inseminate cows once a year. Their gestation period lasts nine months, so the majority of dairy cows’ lives are spent pregnant. When a calf is born, he or she is removed from the mother—generally that same day—to make the mother’s milk available for collection. This is very traumatic to mother cows and to their calves. Male offspring are often raised for veal, while females become the next generation of dairy cows. While large-scale dairy operations are typically separate from beef cattle operations, these industries are connected. Dairy cows usually meet their ends at beef slaughterhouses when, at just two to five years of age, their milk production has slowed or they are too crippled or ill to continue in the industry. At that point, they are slaughtered for beef. Today’s dairy cows each produce about 100 pounds of milk per day, which is 10 times more than cows living just a few decades ago. This is due to bovine growth hormones, unnatural diets and being bred selectively for massive milk production. 75% of downed animals–animals who cannot stand and walk on their own–are dairy cows. About 9 million cows are being used for milk production in the United States at any given time. States including California, Ohio and Rhode Island have banned tail-docking of dairy cows and we expect more to follow. The American Veterinary Medical Association and the Association of Bovine Practitioners both oppose tail-docking for lack of evidence that it provides benefits. Welfare-conscious consumers and companies are committing to certifications that ban tail docking and tie stalls, require outdoor access, and provide guidance to reduce stress and pain from lameness and weaning. Learn more about these third-party-audited programs in our Meat, Eggs and Dairy Label Guide. Veal is the meat of young male cattle born to dairy cows. As males, veal calves are of little use to the dairy industry, and as a dairy breed, they are inefficient beef producers. Traditional veal meat was made pale and tender by restricting calves’ diets and keeping them in stalls so small they could barely move. Increasingly, calves are housed in groups beginning at about six weeks old, but they still lack sufficient space, outdoor exercise, solid food and even the fulfillment of a most basic instinct: the need to suckle. At an age when they would normally be nurtured and protected by their mother, veal calves are often forced to live alone with no physical contact with other cattle. And while calves normally explore their world by grazing, playing and socializing, factory-farmed veal calves are generally kept indoors with few if any environmental enrichments. The veal industry would not exist without the dairy industry. On industrial farms, calves are generally taken from their dairy-cow mothers within a day of birth to be raised for meat. Veal calves’ diets and movements are tightly restricted to keep their muscles from developing, which makes the resulting meat tender. Approximately 238 million turkeys are raised for meat in the U.S. annually. Like chickens, most turkeys are housed in groups on the floors of long sheds where they are denied fresh air, sunshine and pasture. They are forced to breathe dangerously high levels of ammonia emanating from their own waste. Modern, factory-farmed turkeys look very little like their wild ancestors. For one, they are disproportionately breast-heavy (a result of genetic selection), reflecting a consumer preference for breast meat, and selective breeding has resulted in extremely accelerated growth. Their unnaturally fast and disproportionate growth causes turkeys extraordinary suffering, including pain and difficulty simply walking or breathing. Turkeys’ bodies have become so unnaturally disproportionate that they can no longer mate with one another. They are bred year-round via artificial insemination, damaging their bodies that were only meant to reproduce once per year. Between 1965 and 2000, the weight of the average turkey raised for food in the U.S. increased by 57%. Turkeys have the innate urge to perch and fly, but the selectively bred turkeys on factory farms are too large to do so. Unlike the domestic turkey, wild turkeys can fly up to 55 miles per hour and run as fast as 25 miles per hour. Welfare-conscious consumers and companies are committing to certifications that address certain physical alterations as well as the effects of fast growth and require adequate space, better lighting programs and other enrichments. Learn more in our Meat, Eggs and Dairy Label Guide. of farm animals in the U.S. are raised in factory farms. of broiler chickens are produced each year.